The rapidly growing aging population and de-institutionalization of older adults with behavioral health issues suggests that long term care facilities will increasingly need to address the mental health issues of their residents. It is important for staff to be able to distinguish between behavioral issues that can be safely addressed at the facility versus those that constitute a true psychiatric emergency and may require inpatient treatment. At the same time, local CSBs will need to increase their knowledge and skills regarding late life behavioral health issues in order to effectively work with the growing geriatric population and the long term care settings where many reside. This presentation is intended for staff from many levels, disciplines, and settings (both facility and home-based), including staff involved in providing long term care (e.g., nursing staff and administrators), as well as behavioral health staff who work with older adults. Additionally, staff from Adult Protective Services, home health, adult day healthcare, respite care, area agencies on aging, Emergency Department staff of acute care hospitals, hospital discharge planners, and others serving older adults could benefit from the training. Staff participating in this webinar will be better trained to recognize and respond to geriatric mental/behavioral health issues before costly inpatient treatment becomes necessary, or anyone has been placed at risk of injury. For those situations necessitating inpatient treatment, trained staff in the facility and community will be better prepared to work together to facilitate psychiatric hospitalization with minimal distress to the older adult and those family members and professions involved in his/her care. 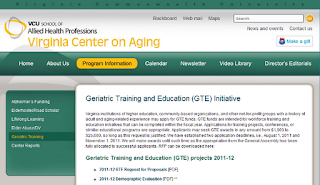 This event was made possible through a grant from the Virginia Center on Aging’s Geriatric Training Education Initiative and supported by the Center for Excellence in Aging and Lifelong Health., the Virginia Geriatric Mental Health Partnership* and the VCU’s Department of Gerontology. Sarah W. Bisconer, PhD, Licensed Applied Psychologist, Emergency Services Coordinator, Colonial Behavioral Health, Williamsburg, Virginia – Dr. Bisconer received her Doctoral Degree in Educational Psychology from the University of Hawaii at Manoa. She received her Master’s Degree in Counseling Psychology and Bachelor’s Degree in Psychology from California State University Humboldt. Dr. Bisconer is a Virginia Licensed Applied Psychologist with recognized competence in statistics, research design, measurement, learning theory, and counseling. She is Adjunct Associate Professor of Psychology at the College of William and Mary where she teaches courses in statistics and supervises undergraduate and graduate research and clinical training. Dr. Bisconer was a treatment team psychologist at Eastern State Hospital for nine years before accepting her current position as Emergency Services Coordinator at Colonial Behavioral Health. She has expertise in the assessment and treatment of psychotic disorders, mood disorders, cognitive disorders, severe personality disorders, and suicide and self injurious behavior. She has conducted research in suicide risk assessment; assessment and treatment of severe challenging behavior; standards of care in the use of psychiatric medicine with persons with intellectual disabilities and mental illness; and the efficacy and impact of second-generation antipsychotics on the mental and physical health of persons with schizophrenia. Her research has been published in numerous peer-reviewed journals and she has coauthored several book chapters in her areas of expertise. For 20 years Dr. Bisconer has provided training to professionals involved in the care and treatment of adults and elders with behavioral and intellectual disabilities, including community and hospital based health care providers, law enforcement officers, jail correctional officers, college and school personnel, and other private and public agencies and groups. Joan S. Thomas, LCSW, FACHE, CMC, LNHA, Interim Administrator, DHAL, Birmingham Green Adult Care Residence, Manassas, Virginia Ms. Thomas currently serves as the Interim Administrator for the District Home Assisted Living, located on the campus of Birmingham Green. Prior roles have included: Assistant Administrator for the Nursing home, the Director of Admissions for the campus, Special Projects Coordinator, Marketing for the District Home and Director of the Social Services Department. She led the work to attain full occupancy of the newest assisted living facility on the campus, Willow Oaks, and worked with the CEO to refurbish and design programming for the original building, the District Home. An accomplished professional in the social work, mental health and geriatric long-term care fields, Ms. Thomas provides supervision, management, strategic planning, community relations and marketing support to the organization. Prior to 2003, Ms. Thomas worked for an HMO in the emergency case management and urgent care department. Ms. Thomas has a B.A from George Mason University and an M.S.W. from Virginia Commonwealth University. Ms. Thomas is a licensed clinical social worker (LCSW) and a licensed nursing home administrator (LNHA) in the state of Virginia. She is a Board member of the National Association of Social Workers (NASW), Virginia chapter and serves as the Chair of the NASW VA Legislative Committee. Certified in Care Management (CMC) she is a member of the National Association of Professional Geriatric Care Managers, and is a Fellow (FACHE) of the American College of Health Care Executives (ACHE). E. Ayn Welleford, PhD, received her BA in Management/Psychology from Averett College, MS in Gerontology and PhD in Developmental Psychology from Virginia Commonwealth University. She has taught extensively in the areas of Lifespan Development, and Adult Development and Aging, Geropsychology, and Aging & Human Values. As an educator, researcher, and previously as a practitioner she has worked with a broad spectrum of individuals across the caregiving and long term care continuum. As Associate Professor and Chair of VCU’s Department of Gerontology, she currently works to “Improve Elder Care through Education” through her Teaching, Scholarship, and Community Engagement. Outside of the classroom, Dr. Welleford provides community education and serves on several boards and committees. She is the Immediate Past Chair of the Governor’s Commonwealth of Virginia Alzheimer’s and Related Disorders Commission. Dr. Welleford is the proud recipient of the 2008 AGHE Distinguished Teacher Award. The Geriatric Mental Health Partnership (GMHP) is an informal, voluntary group which focuses on geriatric mental/ behavioral health care. The group began in 2007 in response to the challenges of difficult behaviors of elderly residents in long-term care (LTC) facilities. Participants of the GMHP include representatives from mental/ behavioral health, aging services, and long-term care professionals representing the private, public and academic sectors. Organizations represented include the Virginia Health Care Association; the Virginia Hospital and Healthcare Association; the Virginia Association of Nonprofit Homes for the Aging; various Community Services Boards (CSB); State agencies including the Department of Medical Assistance Services; Department of Social Services Department of Health; Department for the Aging Long-Term Care Ombudsman; Department of Corrections; Department of Behavioral Health and Developmental Services; Piedmont Geriatric Hospital; Eastern State Hospital; the Center for Excellence in Aging and Geriatric Health (CEAGH), the College of William & Mary; Eastern Virginia Medical School; Virginia Commonwealth University (VCU) Department of Gerontology; Long-Term Care Facility Providers (e.g., nursing homes); and Behavioral Health Consultants. The GMHP has worked tirelessly to improve communication and service coordination between the mental/ behavioral health and long-term care systems, so that older adults are able to receive needed care in a timely manner in the most appropriate setting. One of the key obstacles the group has identified is a lack of relevant training for facility and community staff. In order for seniors in long-term care facilities to receive timely and appropriate mental health treatment, staff members need to understand the issues involved and the procedures necessary to address and implement appropriate treatment. “Pre-admission Screening of Older Adults with Cognitive Impairment: Considerations for Emergency Services Staff”. The current webinar is the second in the series of three described above. Q: I understand we can request an ECO but if the patient is not suicidal or homicidal they get turned around and sent back to the facility. That’s the problem; there is no help for these people. A: Residents of supervised residential settings typically are not hospitalized under the “unable to care for self” criteria since it has been established that they require supervised care. Elders with dementia diagnosis can benefit from inpatient psychiatric treatment if they meet legal criteria for hospitalization and have acute symptoms of psychosis, acute symptoms of depression or mania, acute symptoms of anxiety and agitation, or acute Alcohol or substance abuse problems. Inpatient psychiatric hospitalization is appropriate if there is reason to believe that the acute psychiatric symptoms will improve with a 3 to 14 day hospital admission. Take a long-term proactive approach and implement an evidence based behavior and environmental management program for long term care facilities. Q: CSB has never been able to help us? We recently had a situation, very disruptive resident, and potentially harmful to others, combative. They did not determine this was true and no placement needed. Now, she has been in behavioral health for several weeks. We are always told to call them, but I can’t say they have ever been able to help. A: Know your resources and develop relationships. By discussing crisis situations in advance of a real crisis you may better address the needs of your residents and criteria for acute hospitalization. Know what interventions to implement to mitigate emergent situations. Invite your CSB ES Coordinator to visit your facility. Discuss specific cases or “typical scenarios.” Establish and maintain communication with key clinical staff at your local psychiatric hospitals. Initiate contact with your hospital Emergency Department staff to discuss your shared care of your residents. Q: Is dementia more genetic or environmental? A: Dementia typically is not conceptualized as genetic or environmental. Dementia is a group of symptoms caused by gradual death of brain cells. Dementia results from a deterioration of the physical brain. Dementia is defined as memory impairment plus one (or more) of the following cognitive disturbances: Aphasia (language disturbance); Apraxia (impaired motor functions); Agnosia (failure to recognize or identify objects); Disturbance in executive functioning (planning, organizing, sequencing, abstracting). Q: Can a person with dementia sign themselves into a psych unit or must they be detained? A: A person with dementia can sign themselves into a psychiatric unit if they are considered competent to make their own treatment decisions and they are willing to volunteer for treatment. A TDO is considered If the person is not competent to make their own treatment decisions or if they are unwilling to accept treatment and meet criteria for hospitalization. Q: What do you think about the BIMS assessment tool? A: The BIMS is on the MDS 3.0 (Minimum Data Set) very brief. Prefer the Mini Mental Status Exam (MMSE) for a more complete assessment. Q: I appreciate the clarification between Delirium and Dementia. It seems that Delirium, clinically-speaking, is a bit easier to tease out due to the acute time-frame. Can you recommend a clinician-friendly, uniform Dementia screening tool that can be used for clinical training purposes? Q: Some doctors in an ER obtain an ECO for medical purposes if a person is trying to leave the ER but they are not necessarily for psychiatric evaluation. The police officer asked me if I could come out to evaluate the person. 1) Is the doctor’s request for an ECO appropriate? 2) Should we go out on all ECO’s, regardless of the nature of the request of the ECO? I am asking this question due to my understanding that ECO’s are strictly for the purpose of psychiatric evaluations, hence our involvement. A: The ECO authorizes law enforcement to take custody of and transport a person to a Preadmission Screener for evaluation. The ECO is not issued for medical treatment; however, the ECO can include medical evaluation and clearance as part of the Preadmission Screening. Physicians can request a Medical TDO for treatment of a life threatening medical condition. Be sure to consult with your supervisor for directions on responding to an ECO.